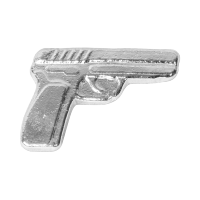 This unusually sized 2 troy ounce 3D art bar is crafted to look like a pistol, complete with trigger! Reverse Monarch Precious Metals logo and the words "2 Troy oz 999 Fine Silver"
Monarch Precious Metals logo and the words "2 Troy oz 999 Fine Silver"
2 oz Monarch Precious Metals Hand Poured Handgun Silver Bar This unusually sized 2 troy ounce 3D art bar is crafted to look like a pistol, complete with trigger! All Monarch bars are hand poured and stamped the old fashioned way, with no two bars being alike. All bars have genuine character, with dips, ripples and uneven surfaces. Add something unusual to your stack, grab some of these today!